For in the final analysis, our most basic common link is that we all inhabit this small planet. We all breathe the same air. We all cherish our children's future. And we are all mortal. At many points, this book reads like a political suspense novel -- well paced with high stakes, but it was by no means a fun or easy read, mostly because the reader doesn't have the psychological exit of fiction. Robert Ellsberg of Orbis Books, who published JFK and the Unspeakable, passed on the manuscript at first because of both its length (over 500 pages) and its subject matter. But changed his mind after getting positive feedback from several historians and analysts he'd passed it to. Much of the book is based on intriguing sources such as declassified government documents obtained via the Assassination Records Collection Act of 1992, including secret correspondence between Kennedy and Khrushchev from 1961 -- 1963, transcripts of Kennedy's secret recordings of his meetings with his Joint Chiefs of Staff (JCOS) and other national security advisors during the Cuban Missile Crisis, and KGB documents regarding Kennedy's assassination that were unexpectedly handed over to President Clinton by Boris Yeltsin. It is dense in terms of information and sources and it is also wrenching. At times, I had to put the book down for a while because it was just too overwhelming, even for a reader who lost her naivete long ago about the U.S. political class in general and foreign policy in particular. The book elicits a profound respect for the moral courage demonstrated by both President Kennedy and his Cold War counterpart, Soviet Premier Nikita Khrushchev, at moments when so much hung in the balance. The bond these two men developed as a consequence of their taking humanity to the brink and the terror they both felt from looking into the abyss led to a mutual desire to negotiate an end to the Cold War and work toward disarmament. It is a story of great promise that we all know ends in tragedy. This book underscores both the promise and the tragedy of what might have been. Although I find the assassination itself compelling and necessary to understand, I actually found the story of Kennedy's turn from a Cold Warrior to an advocate of peace to be even more intriguing and will focus my review on that aspect of the book. Interestingly enough, Kennedy's first impression of Premier Khrushchev during their meeting in Vienna in 1961 where they agreed upon a neutral government for Laos was unfavorable. Reportedly, Khrushchev sat stone faced in response to Kennedy's stated concerns about the human costs of a possible nuclear war between their respective nations. 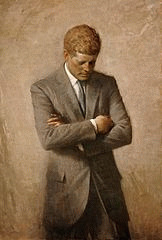 Kennedy would be forced to revise that opinion when Khrushchev initiated a secret back channel correspondence with him in September of 1961 -- a correspondence that the premier felt he had to keep hidden from the Kremlin and the Soviet military establishment due to hardliners in his government who would view such a project as alarming and weak. Kennedy would eventually learn that the very same dynamics were going on in his own government. By 1963, he would have to bypass his own State Department to continue his correspondence with Khrushchev. Khrushchev's first letter, which was 26 pages long, expressed regret at their inability to connect at the Vienna meeting, most likely due to distrust, which prevented them from working on more mutually beneficial goals. The Premier likened their situation with "Noah's Ark where both the 'clean' and the 'unclean' found sanctuary. But regardless of who lists himself with the 'clean' and who is considered to be 'unclean,' they are all equally interested in one thing and that is that the Ark should successfully continue its cruise. And we have no other alternative; either we should live in peace and cooperation so that the Ark maintains its buoyancy, or else it sinks."